Travel outside of peak Summer season and public holidays to enjoy less crowded boats. We are comparing Amsterdam Hop On Hop Off Boat Prices from leading ticket suppliers and Try to find you Cheap tickets prices on the market. the hop-on-hop-off boats depart every 25 minutes in peak season with 9 stops across 2 routes. the modern partly enclosed boats (with roof that opens depending on the weather) have amble seating for everyone and large glass windows for panoramic viewing plus toilet facilities onboard and free wifi access at selected stops. Your ticket is valid for 24 hours or 48 hours use (depending on option paid for) starting from the 1st time you board the boat. Boats run until 5.15pm in the Winter and until 7pm during Summer, sometimes until 9pm in the peak Summer season. this is the same concept as the famous hop-on-hop-off buses you find in other cities but being Amsterdam, it\'s a boat that goes along the canals. Move easily around the top museums and tourist attractions in the city. Learn about Amsterdam as you move from place to place with audio commentary in multiple languages. Good for those who want to explore the city on their own, making up their own itinerary for the day. Good for the whole family – Difficult to get lost and no more tired feet! there\'s even a toilet onboard so you\'re assured of a regular toilet break and won\'t have to go searching in the city!! Your Experience With Amsterdam Hop On Hop Off Boat? Jump aboard the hop-on-hop-off canal boat at any of the marked stops and move around the city with ease whilst enjoying your unique vantage point of seeing Amsterdam from the water. You can stay onboard and do an entire loop, listening to the audio guide to understand the sights you\'re passing and get a feel of the city or you can hop off at the next stop or one further down the route to start a fun-filled day of sightseeing. the stops are conveniently located and the boats run regularly enabling you to reach a variety of museums including the Anne Frank museum, Van Gogh Museum, the Rijksmuseum, as well as picturesque and historical parts of the city such as the Albert Cuyp Market, Jordaan, Vondelpark and so much more. What Amsterdam Hop On Hop Off Boat Includes? Make use of the walking tours that are available for free from the stops Anne Frank house/ Jordaan and Central station west, tours are usually available from 1:45pm – Be sure to enquire when you board. 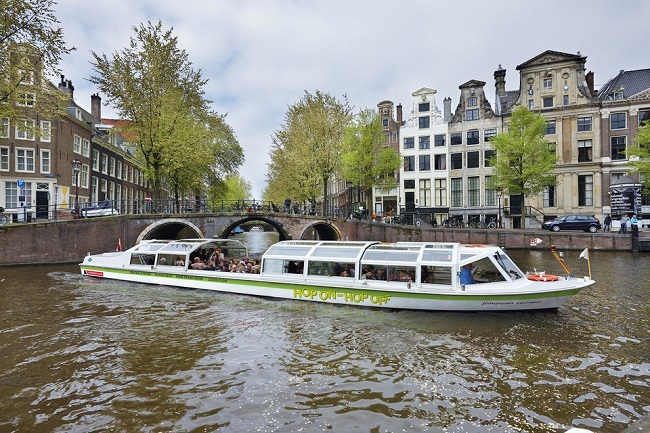 Travelers Reviews about Amsterdam Hop On Hop Off Boat? Travellers talking about the Amsterdam Hop-On-Hop-Off boat on Trip Advisor, Viator, and GetYourGuide give it high ratings and good reviews. they say that this boat makes moving around the city to enjoy sightseeing very easy and enjoyable. they say that the tickets are great value, the commentary onboard is informative, and the hop-on-hop-off stops are well signposted. Some travellers reported having to wait for a boat for more than 25 minutes in the Winter season and others wished that the staff would smile a bit more but overall, travellers highly recommend this boat saying it\'s a convenient, relaxing and enjoyable experience for moving from A-B. Tickets must be printed, e-tickets not accepted. Make sure you have printed your confirmation voucher – E-vouchers not accepted on the boats.